Welcome to the fifth step in our free self-paced course to help you set up your own personal or professional educator blog! Explain how widgets are used on personal educator blogs. Introduce you to the commonly used widgets. Show you how to change widgets and add widgets to your sidebar. Introduce how categories and tags are used. Show how educators use categories on blogs as part of their ePortfolio. Not all blogs have sidebars so not all blogs use widgets, however, they are quite common and useful. 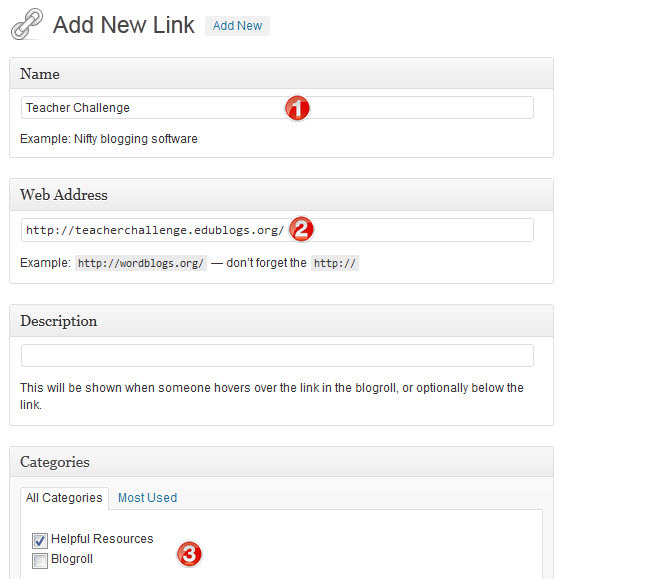 The Edublogger is an example of a blog without sidebars. 2. Click on the arrow on the desired sidebar to open up the sidebar (so you can add the widgets). 3. Drag the widget from the Available Widgets into the desired sidebar. You drag by clicking on the widget with your left mouse button and moving the widget. 4. Drop the widget when you see a dashed line appear — this indicates the widget is in place. 5. The widget will automatically open — just configure, click Save, and then Close. 2. Click on the small arrow on the right-hand side of the widget you want to remove. Blog Avatar Used to display your blog avatar (uploaded via Settings > Blog Avatar). Calendar Displays links to your posts by date on a calendar. Can’t be used as an Events calendar. ClustrMaps A simple widget for quickly adding a ClustrMaps to your blog sidebar. It’s added when the Widget plugin is activated in Plugins. Custom Menu Allows you to display pages, categories, and custom links with a single widget. To use, you first need to set up your custom menu in Appearance > Menu. Email Subscriptions A simple widget for adding email subscription to your blog. When readers sign up, they get an email to let them know when you’ve published a new post. Links Used to display a list of links in your sidebar. It’s commonly used to share your favorite blogs or websites with your readers. Meta Simple widget for easy log in and log out of your blog, to access your dashboard and to locate your RSS feed. Pages Displays a list of your pages in the sidebar. Commonly used for themes that don’t have page links in the top navigation. Recent Comments Displays the most recent comments left on your blog by readers. Recent Posts Displays the most recent posts you have published. This makes it easier for readers to see what’s new on your blog. Search Adds a search box to your sidebar that makes it easier for readers to search the contents of your blog. Tag cloud Displays a cloud of the tags that you’ve assigned to posts. It helps your readers quickly see what topics you write about. Text Allows you to add text or embed code to your sidebar. This is a very useful widget because you can use it to add content from other sources to your sidebar using their embed code (Note: only available on Pro or CampusPress blogs). Some widgets are also added to your widget area when you activate plugins. When adding widgets think about does it add to your blog OR does it distract readers from your posts? You need to have a balance between widgets and your blog content; you want people to read your posts! Sidebar clutter is a good way of convincing first time visitors NOT to subscribe to your blog. The trouble is, sidebar clutter creeps up on all of us. Making it easy for readers to know what you write about and to find content. Encouraging readers to connect with you on your social networks or subscribing by email. You do this by placing the most important widgets near the top of your sidebar(s) while removing any widgets that aren’t needed. How to connect with you on social networks (see an example of this on Sue Waters’ personal blog here). Some people also like to display the most popular posts from their blog and/or a text blurb/image to introduce themselves (check out the example on Kathleen Morris’ blog). With all other widgets, you need to balance your personal desires with minimizing sidebar clutter. It’s normal to see more widgets on class and student blogs. You’ll find examples of the most popular widgets used on class and student blogs here. Tags and categories are used on posts to help readers locate information in different ways. Categories are like chapters of a book; they provide a general overview of the topics you blog about. Tags are more like the index at the back of the book and explode the topic into a million bits. Another analogy is like shopping at a clothing store online. You’ll see different broad categories like men, women, children, baby etc. Then each of those category pages will have more specific options like dresses, shirts, pants, sleepwear, swimwear etc. Think of these as the tags. 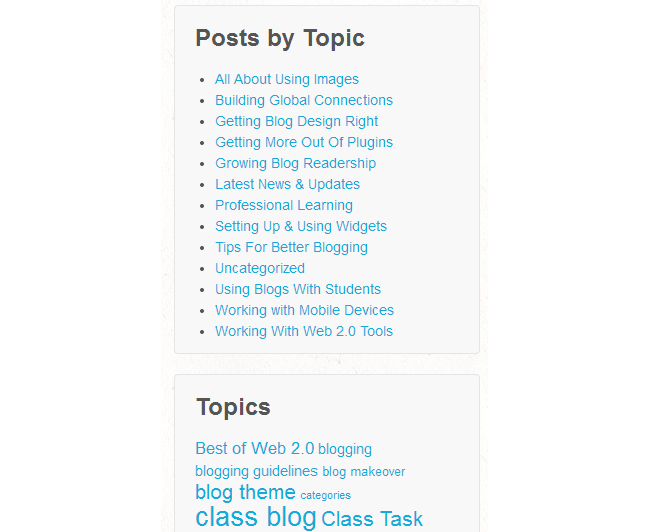 The categories and tags are displayed in your blog sidebar using the categories widget and tag cloud widget. 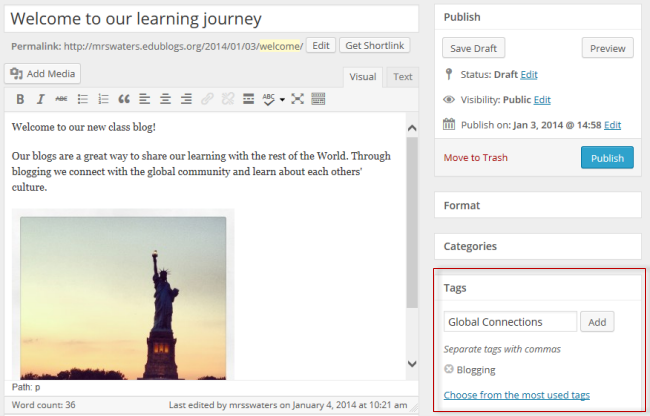 You can also sometimes see tags and categories near your blog post title or under the post, depending on your theme. When your readers click on one of your categories or tags, a page loads with all posts that use that tag or category. Well organized categories and tags can make it much easier for your visitors to find content that interests them. You want category names to be unique and descriptive so your reader understands the type of subject matter they will find when they click on the link. (e.g. a category game of ‘other’ or ‘random’ is not ideal). As a general rule, you tend to limit the total number of categories you use on a blog. Perhaps have 5-10 total categories that all your blog posts can fit into. 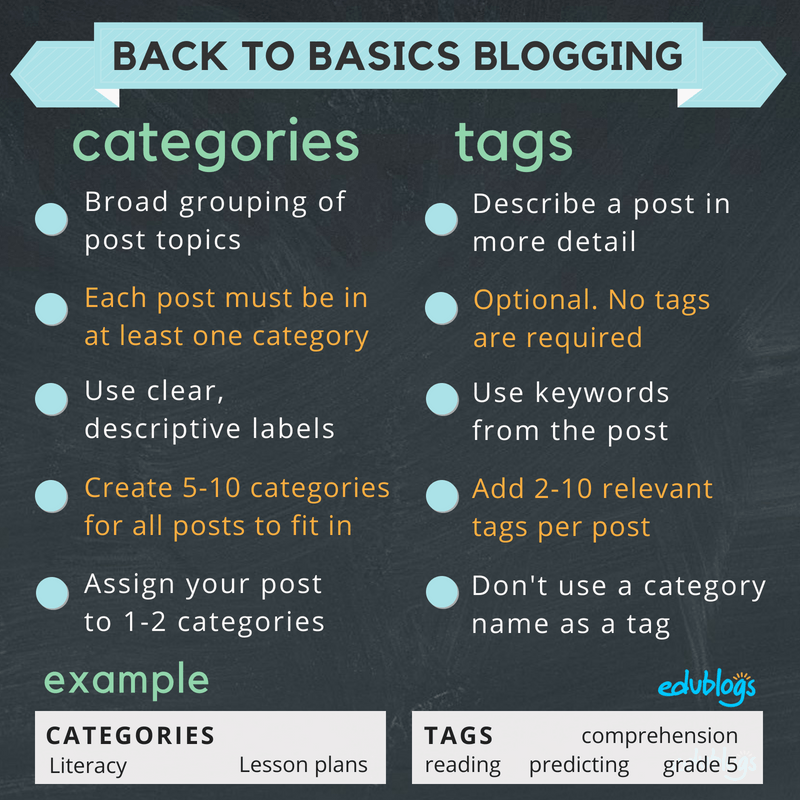 Then assign 1-2 categories per blog post. All posts need to have at least one category but tags are optional. The default category is called ‘uncategorized’. This is not ideal. You can change the name of your default category by going to Posts > Categories. And your tags might be things like Creative Commons, public domain, Twitter, Facebook, iPad, tablet, Student Blogging Challenge, internet safety etc. You want to avoid having the same name for a category and a tag. Increasing numbers of educators now use their blogs as their ePorfolio. We are also seeing more educators document their achieving of teaching standards on blogs. For example, in Australia teachers are encouraged to document their evidence to show the work they did to meet the criteria set out by The AITSL Teacher Standards. 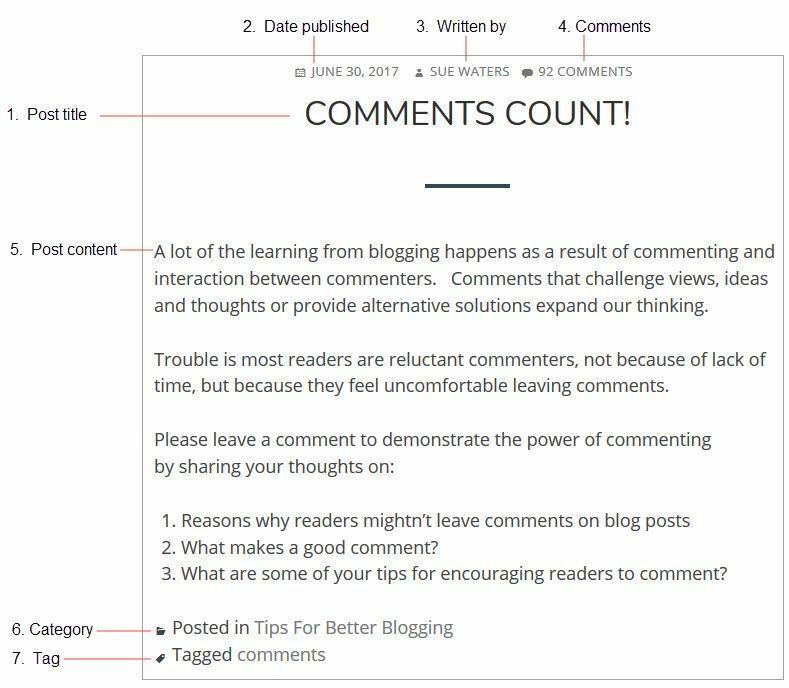 Some teachers do this using their blogs, and assigning the appropriate AITSL Teacher Standards, when they publish a post so they can use a custom menu to send posts to different pages on their blog. 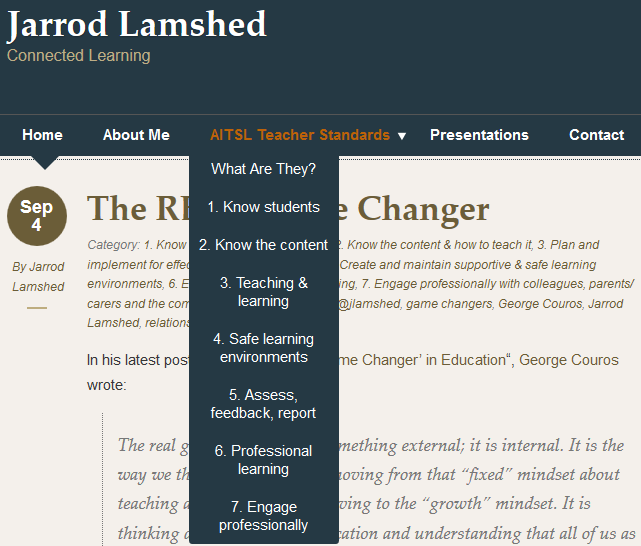 If you look at Jarrod Lamshed’s blog you’ll see a link to The AITSL Teacher Standards in the top navigation and when you hover your mouse over The AITSL Teacher Standards you see a sub-menu with links to each standard. Clicking on a standard takes you to all the posts assigned the category e.g. ‘Know Students’ takes you to all the posts assigned the category Know Students. You’ll see a similar approach on Paul Heubl’s blog. If you look at George Couros’s Principal of Change blog you’ll see Principal standards documented. Think of categories as if you were listing the chapters at the front of a book. Make them descriptive enough so your readers understand the subject matter you’re writing about. Ideally use 10 or fewer categories under which all of your content can neatly fit. But don’t stress too much! You can always edit them again later! You normally add categories to posts before you publish them using the Categories module to the right of your post editor. All you need to do is select the checkbox next to a category you want to use. Now to complete the process, all you need to do is add your Category widget to your blog sidebar via Appearance > Widgets. This is done by assigning different categories to posts, such as teaching standards, workshop, professional development, presentations, and then use a custom menu to create links to each post category in the top navigation of your blog. You’ll find step-by-step instructions on how to use categories with a custom menu here. We’ve used an example of a class blog where teachers want to use one blog for multiple classes or subjects — but it is the same process for setting up an ePortfolio on a personal educator’s blog. Tags can be displayed on your blog as a tag cloud; clicking on a tag name will take your readers to all posts tagged with that term. The larger the size of the word in the tag cloud, the more posts that have been tagged using that term. Remember, your tag cloud displays your top 45 tags. Find out how to add the tag cloud widget. You don’t need to come up with a list of tags ahead of time. When you’re writing your post, you can click on ‘choose from the most used tags’ on the right-hand side of your blog editor. Now to complete the process all you need to do is add your Tag widget to your blog sidebar via Appearance > Widgets. You can add any other widgets you find online by pasting their embed code into a text widget in your sidebar. This is for Edublogs Pro and CampusPress users only to prevent misuse by spammers. This is how you add widgets from Twitter, Pinterest, Shelfari Bookshelf, Flag Counter, Google Calendar and so on! Some educators like to use tracking widgets on their personal blogs. ClustrMaps ClustrMaps is a thumbnail hit counter map widget that shows the geographical location of all visitors to your blog. Number of visitors from a location is indicated by the relative size of the dot. Clicking the ClustrMaps thumbnail takes you to a large World map so you can examine your traffic sources more closely. Here are detailed instructions on how to add a ClustrMaps using the ClustrMaps widget. Flag Counter Flag Counter widget shows the total number of visitors from each country next to the country’s flag. Every time someone from a new country visits your site, a new flag will be added to your counter. Clicking on the flag counter takes you to your Flag counter page which provides more detailed charts and information about your visitors. Revolver Map Revolver Map displays all visitor locations and recent hits live and in realtime on a revolving globe of the Earth. A click on the widget opens the live statistics page. Links widgets are commonly used on a personal educator blogs to provide links to blogs they like to read and resources— they are designed to readers find websites easily. Blogrolls used to be a standard feature on personal/professional educators blogs but some bloggers prefer not to use them now due to the size of their networks. 1. Go to Links > Add New. 2. Add the name of the website or blog to the Name Module. 3. Add the URL to the Web Address module. The best option is to copy/paste the URL from the address bar of your web browser (you’re less likely to make a mistake). 4. 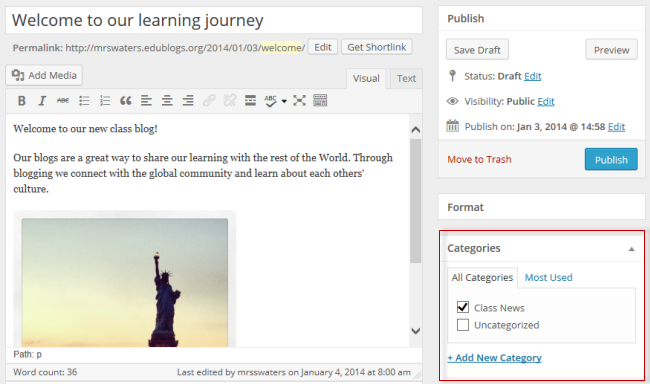 Select Blogroll in the Category Module or create a new Category then click Add Link. You use different categories if you organize your links in different locations in your sidebars. Once you’ve created the links, you add them to your sidebar by adding the Links widget (via Appearance > Widgets). Here are answers to some commonly asked questions we receive about widgets. 1. I’m trying to remove a widget and I can’t find it listed in my sidebar in Appearance > Widgets. How do I remove it? The most common reason why you may have trouble removing a widget, or see two of the same widget on a blog, is if some of the widgets have been hard coded into the theme. Any hard coded widgets can’t be removed. NotePad Chaos is an example of a theme with hard coded widgets. Pages, Categories, Links and a What is this Place are all coded into the theme. 2. Why don’t the categories I set up in Posts > Category display in my Category widget? Categories and tags on posts are used to help readers locate information in different ways. When your readers click on a categories link on a post or in your sidebar, it loads a page with all posts that use that category. Categories won’t display in your category widget until the category has been assigned to a post. 3. Why are some tags in my tag cloud widget larger than others? The larger the size of the word in the tag cloud, the more posts that have been tagged using that term. 4. Why doesn’t my calendar widget show the correct date? If you want an Events calendar we recommend you add a Google Calendar to your sidebar or embed it into a page. Alternatively, if you want to add a simple calendar use this Monthly Caldendar. Look: Visit some of these educator blogs then leave a comment on this post to tell us which widgets on their blog you would use on your blog and why. Add: Now try adding some widgets to your blog. Leave a comment to let us know what widgets you added and share a link to your blog so we can have a look at your new widgets. Post: Write a post on what you would include on your list of ‘must have’ widgets for personal educator blogs. Or reflect on what you have learned about widgets. Don’t forget to add categories/tags to your post! Leave a comment with a link to your post so we can check it out. For my blog, I added widgets, such as a calendar and a google search bar. This step was the most challenging by far to begin with but after playing around with it i think that i got the hang of it! I added the calendar widget which is a must have for me because my and my calendar are best friends! I don’t think i could survive without it. 1) There were a few widgets I saw that I liked. I liked the “What’s Hot” on the CoolCatTeacher, the IG photo feed on George Couros’ blog, and the “Where in the World” from edutech4teachers. I liked these because they are things I found eye catching and interesting. Some of those blogs looked so cluttered though! I clicked off right away because there was so much going on and they had very “bleh” colors and themes. Again, I’m an elementary teacher, so I live my life in color and rainbows! This step, was a great way to keep your page organized. This was a fun step to complete! It keeps the blog organized. Using widgets made my blogging page easier to navigate. It made my page look more professional once I figured out how to use it. This was a step we completed together as a class. It was confusing at first but adding widgets makes it easier to navigate through blog and makes it look more organized and professional. This was a very confusing step for me at first, but I was able to figure it out when it was explained to us in class. This was a fun step to complete!